NIA Charlestown Nevis (October 16, 2017) – The following is an address by Hon. 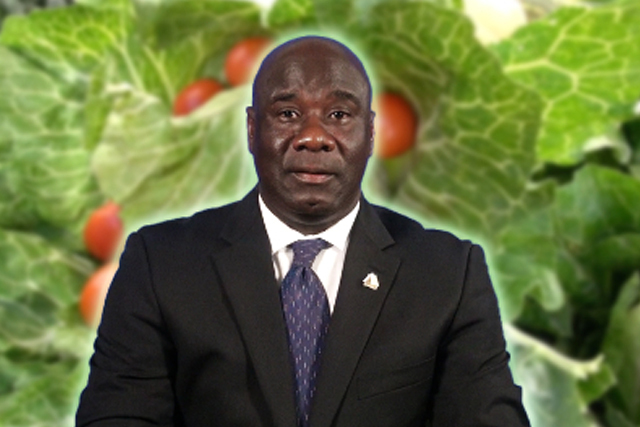 Alexis Jeffers, Minister of Agriculture, dated October 13, 2017 in recognition of World Food Day on October 16. Fellow citizens and residents, World Food Day is an observance formalised by the United Nations Food and Agriculture Organisation (FAO) and celebrated annually on October 16. As Minister of Agriculture in the Nevis Island Administration I am delighted to address you on the occasion of World Food Day 2017. The theme for this year is Change the Future of Migration – invest in food security and rural development. According to the FAO, the world is on the move. More people have been forced to flee their homes than at any time since the Second World War II due to increased conflict and political instability. Hunger, poverty, and an increase in extreme weather events linked to climate change are other important factors contributing to the migration challenge. As we recently experienced, several of our neighbours were devastated by Category 5 hurricanes Irma and Maria and we continue to be grateful that Nevis was spared the full brunt of these storms. World Food Day provides an opportunity for us as Nevisians and residents to join millions around the World in the fight against hunger. World Food Day is also observed to give us an opportunity to pause and join with people the world over in strengthening the struggle for freedom from hunger, and to offer all countries an occasion to highlight the crucial importance of food and agriculture to their people. In our continuing food security thrust on Nevis it is the vision of the Ministry for our farmers to grow food that is abundant and safe. We continue to encourage the selection of varieties of plants and species of animals that have proven to perform best in our particular climate. We urge the use of organic fertilizers and safe application of these chemicals to prevent pests and diseases from affecting our agricultural produce. In 2016 World Food Day was observed under the theme “Climate is Changing, Food and Agriculture Must too”. We continue to encourage our farmers to ensure climate smart practises are employed as it is our way to ensure there is safe and abundant food to satisfy our people. The Ministry in that same vein is encouraging our population to buy and eat our local fruits and vegetables as well as meat products from our abattoir that are not only a much healthier option but also rich in flavour. When we look at what is happening internationally, large movements of people today are presenting complex challenges, which call for global action. Many migrants arrive in developing countries, creating tensions where resources are already scarce, but the majority, about 763 million, move within their own countries rather than abroad. This creates conditions that allow rural people, especially youth, to stay at home where they feel it is safe to do so, and to have more resilient livelihoods, and this is a crucial component of any plan to tackle the migration challenge. While our rural condition may not be the same as other countries we do have a large number of small and back yard farmers that continue to contribute significantly to food production on the island. One of the ideas that we are embracing is the specialisation of certain crops by farmers that would allow their smaller farms to achieve better economies of scales thus increased returns on their investment. The Ministry also encourages agro-processing which allows for increased availability of various products and has the added benefit of reducing the spoilage rate. The Food and Agriculture Organisation notes that by investing in rural development, the international community can also harness migration’s potential to support development and build the resilience of displaced and host communities, thereby laying the ground for long-term recovery and inclusive and sustainable growth. Producing food in a sustainable way means adopting practices that produce more with less in the same area of land and use natural resources wisely. Since there is the added burden of food losses, it also means reducing food losses before the final product or retail stage through a number of initiatives including better harvesting, storage, packing, transport, infrastructure, market mechanisms, as well as institutional and legal frameworks. Fisher folks too are encouraged to adopt practices such as use of biodegradable materials in the construction of fishing traps, release of juvenile fish or adult fish with eggs, use of approved sizes of nets, as well as Fishing Aggregate Devices (FAD) for deep sea fishing. With greater investment and the adoption of good fishing practices, food security is supported for preserved and future generations. Our recent thrust in green house technology allows for the production of one or two specialized crops in controlled conditions that increase the yields when compared to traditional field farming. Our efforts in establishing forage banks on the government estates allow for all year round food production and availability of food for our animals. We also commend poultry farmers and in particular those involved in egg production; however we are encouraging sustained broiler production here on Nevis to further boost the poultry industry. As we join in this universal observance of World Food Day, the question would be, what can we do to change food and Agriculture as climate continue to change? We all have our respective parts to play. The Ministry of Agriculture, Fisheries and Co-operatives will continue to vigorously promote technologies and practices as well as tap into the knowledge base of our allied agencies to transfer the necessary information to farmers as we tackle food security issues. Additionally, the Ministry as well as Farmers, Fisher folks and Agro-processors need the support of the Nevisian community, by being conscientious or ethical consumers and changing simple day-to-day decisions, for example, buying from local farmers and our local supermarkets and insisting to purchase locally produced items. It is the safer and healthier choice that can make a significant difference. We recognize that Migration is part of the process of development as economies undergo structural transformation and people search for better employment opportunities within and across countries. Migration can contribute to economic growth and improve food security and rural livelihoods, thus advancing countries’ progress in achieving the Sustainable Development Goals. On a yearly basis inroads are made but there are no goal lines, we have to continue adapting and become more innovative using fewer resources to achieve greater yields. And so, as we observe World Food Day 2017, let us focus our efforts to support local production, let us also continue to eat more of what we grow and grow more of what we eat. By investing in Food Security and Rural Development we can create equality, job opportunities and give our people choices. Thank you for listening. Have a Wonderful World Food Day 2017 and may God continue to bless us all.